The keen eyed amongst you might notice as you read this post that it looks a little different around here- that is thanks to the rather wonderful Gillian of Elevator Musik. Hasn't she done the most amazing job at making Chloe Likes To Talk amazing? The redesign was long overdue, and goes with the shiny new domain name- www.chloelikestotalk.co.uk and I've even set up a Facebook page for the blog if you're that way inclined. My blog is almost certainly never going to be my full time job, and I've never pretended to be a professional blogger or journalist, Chloe Likes To Talk has been my hobby for a few years, it's a tiny bit my baby and it's been amazing to interact with other awesome people and have so many cool opportunities, all that said, I really wanted everything to look a bit more sleek, shiny and professional. It's in my nature to want something to be as good as it possible can be, and having a more cohesive 'brand' for the blog has made me a very happy little bunny. I'd love to hear what you think of it- if I can improve anything or if you think there are additions I could make. Now, onto the important bit. FOOD! Speaking of opportunities, by a long shot the best one I've had of late was to 'Mystery Shop' for the MEAT brand who have MEATLiquor off Regents Street and MEATMarket at Covent Garden. Basically, they wanted me to go forth, eat, enjoy, and then report back. What a shame. It was SUCH a hardship. I have eaten at MEATMarket before, and going back this time was no change from the usual awesome. Go on, have a drool, you know you want to. 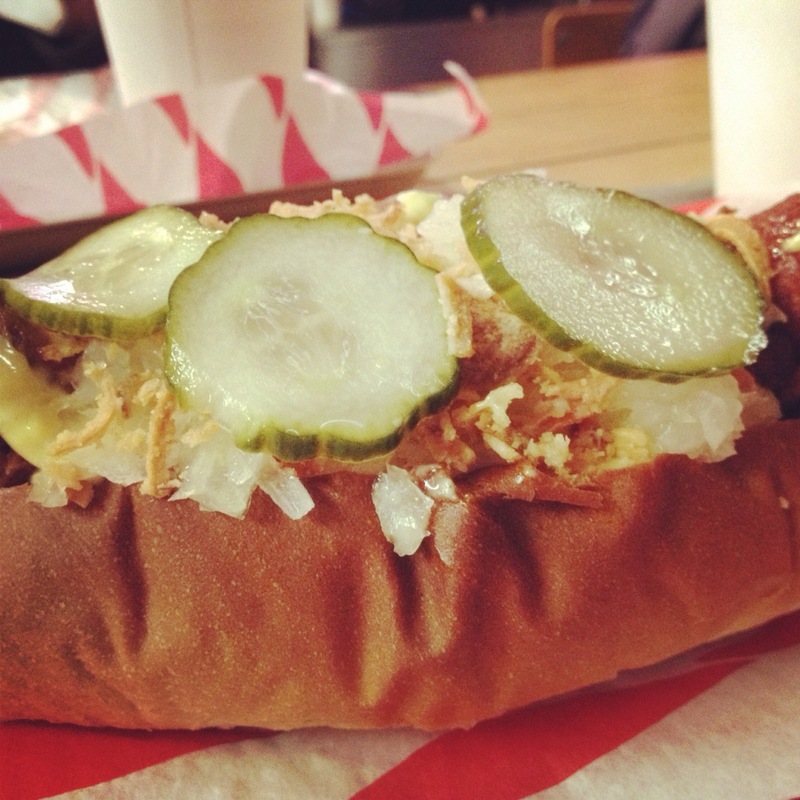 I've had the Ripper Dog that T chose before, it is perfection although I'm still not sure what Danish sauce is. My burger was new to me, but holy ground down cow, it was amazing. As a serial pickle lover I was in heaven. 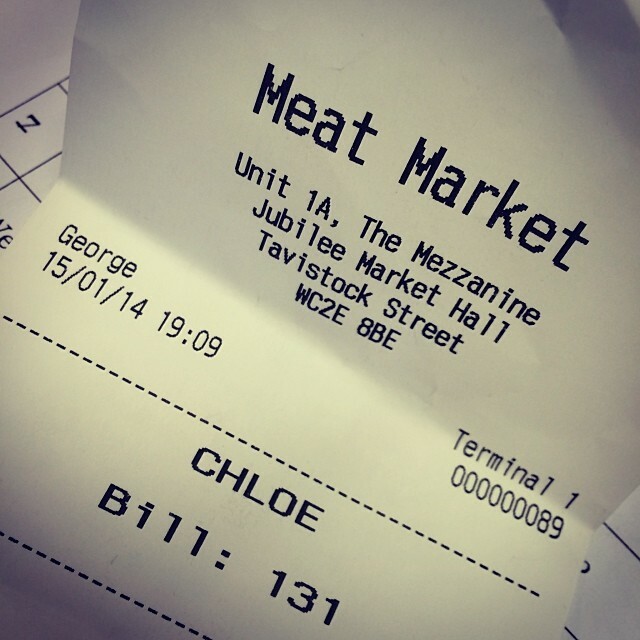 MEATMarket is known for it's 'basic' approach to service- you order at the counter, grab a seat at any bench you can find a space at, no plates, no glasses, plastic cups and paper towels. I am continually in awe that as Londoners we have bought into it so heavily that we'll queue for it, what a cracking business model. I do love the easy atmosphere of it, and it always brings a smile to my face to see people like I was last night, in their work suits/clothes, stuffing messy burgers into their faces. One thing that isn't basic about MEATMarket is the service from staff themselves though. Just because they don't bring the food to your table doesn't mean they're not helpful, friendly and generally good fun. Every time I've been to MEATMarket, I've always had a bit of a laugh and a short conversation with the staff at the counter and because we ordered Black Cow drinks (vanilla ice cream with Coke- childhood in a glass) which took a couple of minutes to make, rather than make us stand around waiting, George was happy to come find us with them. They didn't have to, and that's the nice thing. 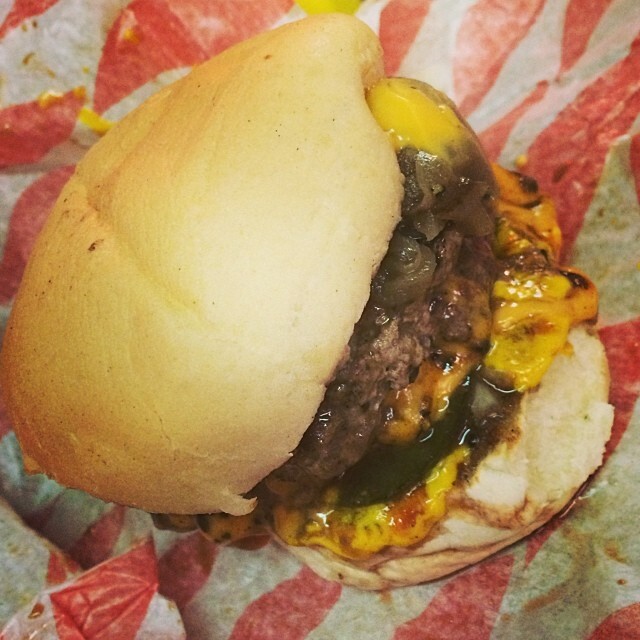 The other thing to say about MEATMarket is about value. When I first clocked the prices, I was a bit dubious, it seemed.... pricey. £8.50 for a hotdog? £3 for a plastic cup of soft drink? But.... here's the clincher- the portions are pretty substantial. I think it would be fair to say you get your £8.5 worth of hotdog when it's fatter than my wrist and bulging at the seams. My burger had 2 patties of beef in it as well as everything else, and you are free to refill your soft drink (including the coke element of the Black Cow drinks we ordered) as much as you like. T & I also shared some Bingo Wings (hot sauce that I could taste- bonus) and some fries- the wings portion had 10-12 pieces in it, the fries were not finished between the 2 of us. Despite initial reservations, I felt that we got pretty good value for money based on portion sizes and refill bonuses. I think as Londoners we love a bit of hype. I did once queue for Patty & Bun, and I walked past Five Guys the other day- the queue should really have had it's own postcode, and MEATMarket is a bit the same- at busy times you may have to queue and it's certainly been a 'Blogger' cliché, but where they win is by providing something that is actually awesome, doing it well, and keeping with it. And now- training, as after all that fried food yesterday, I'm a touch on the sluggish side- even with my cycle to/from work today. All this eating, it's tough you know.